Are you searching for the best kids Easter Basket ideas? These adorable DIY Peeps Bath Bombs are a fun candy free option! I can’t believe Easter is just around the corner and I’m just now preparing! It seems like every year, I wait until the very last minute to gather everything I need for the girls’ Easter Baskets. I try very hard to keep most of the items in their baskets in alignment with our natural lifestyle. In the past, I’ve purchased bath bombs to include in their baskets. This year, I thought it would be a fun idea to make bath bombs for their Easter Baskets using an adorable Peeps mold (you can find the silicone mold on Amazon or in many craft stores). While we may not eat Peeps, we can join in on the fun this way! If you’re looking for a fun DIY Easter Basket idea, give these Peeps bath bombs a try. This recipe will yield 12 bath bombs – plenty to go around. Your kiddos will adore them! Add the baking soda, cornstarch, coconut oil and citric acid into a glass or metal bowl. Stir until well incorporated. Divide the mixture up evenly into 4 small bowls. Add your favorite essential oils into each bowl and stir (I used citrus essential oils such as sweet orange, lemon and grapefruit). Add a few drops of your desired colors (I used pink, purple, green and blue). Mix well to distribute each color. Spoon the colored mixtures into the Peeps molds. Pat down firmly. Put the Peeps mold on a cookie sheet and place in the oven. Turn the preheated oven OFF and leave the mold in the oven for 1 hour, keeping the door closed. Remove the Peeps mold from the oven and allow to cool for an additional 2 hours. Carefully pop each bath bomb out of its mold and store in a mason jar or other glass, airtight container. Use a bath bomb by dropping into your warm bath water. As it dissolves, enjoy your favorite essential oil aroma and moisturizing coconut oil! Did your kids love their Peeps bath bombs as much as mine? Those are adorable! 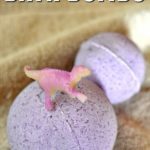 I was thinking of doing bath bombs with a plastic Easter egg as the mold, but this is way cuter! I’ll have to give them a try!